"I knew I should'a taken that left turn at Abeir-Toril." — Xorn, Rusty and Co. Comedy: The traveler encounters many wacky mishaps and quaint natives during their efforts to get back on track. Drama: The traveler encounters survival situations like finding food and shelter, or else dealing with increasingly limited resources while trying to avoid being eaten by predators or angering local peoples. See Deadly Road Trip. Horror: The traveler finds himself being actively hunted down by some menace (natural or supernatural), not necessarily because of anything the traveler himself has done, but just because It's What I Do. Can be caused by Road Sign Reversal, Your Other Left, Short Cuts Make Long Delays, No Sense of Direction, or trying to follow overly complicated directions. When done in a science-fiction setting, it's Teleportation Misfire. Frequently the way to enter a Dark World or Down the Rabbit Hole. Once the traveler gets in, he may not be able to get back out, thanks to it being a Closed Circle. Laff-A-Lympics: In the special story "The Man Who Stole Thursday", Tempus tries to leave the Flintstones' time for present time but arrives at the Jetsons' time instead. Tempus believes it happened because he made a wrong turn at the Spanish-American war. Cutter John: Somebody get out the damned map! In one Brother Juniper strip the small sailboat Juniper and another monk are crewing somehow ends up off the coast of what's obviously Italy. Brother Juniper: Something tells me I took the wrong tack at Montauk! In Stargate Equestria, the SG-1 team winds up on Equestria when Daniel misdials a Stargate trying to get them home. Lightning McQueen's excursion at Radiator Springs pretty much entirely results from taking a wrong turn on Route 66. Also applies to Minny and Van, the couple of lost tourists. All the National Lampoon's Vacation movies except for Christmas Vacation. In Dumb and Dumber, the two leads are driving across the country. When they swap driving duties, the new driver takes the wrong freeway ramp and ends up going back several states before he wises up. Occurs in The Rocky Horror Picture Show. Brad takes a wrong turn at a fork in the road leading him and Janet to a dead end, getting a flat tire, and having to seek shelter in Frank N. Furter's castle. In Doc Hollywood, Michael J. Fox gets lost in the Deep South. Hilarity Ensues. At the end of the Kamen Rider movie, Movie War CORE, Eiji Hino returns to the surface from a subterranean battle by crawling out of a manhole in Brazil. John Cleese's role in Clockwise turns this trope Up to Eleven. "Manos" The Hands of Fate, trying to get to The Valley Lodge. In Ace of Aces, a Bavarian celebrational cart pulled by oxen inadvertently causes a Road Sign Reversal just as Jo Cavalier (the main protagonist) is driving a Jewish family down South, directly leading them to Adolf Hitler's house in Berchtesgaden instead of the Austrian border. In The Phantom Tollbooth, Milo takes a wrong turn at a fork in the road while driving to Dictionopolis, and he ends up (quite literally) stuck in the Doldrums, where the Lethargians dwell. In Mark Twain's story "Captain Stormfield's Visit to Heaven", the dead protagonist must fly through space for thirty years or so in order to reach the gate to Heaven. On his way, he makes a single, minute deviation from his course, and ends up reaching an entirely different gate "billions of leagues from the right one." Doctor Who gives us Jack, who tells them a story which involved fifteen naked Time Agents running from something big and covered in tusks, where he turned to his friend and shouted: "I knew we should have turned left!" The music video note link is for the full video containing that and several other music videos, as the only other upload available starts after the intro serving as an example of this trope. The music video itself starts at the 2 min., 9 sec. mark for the title track of CCM artist Randy Stonehill's 1985 release "Love Beyond Reason" begins with narration explaining that Stonehill, driving the tour bus, missed a turn at Albuquerque and wound up in Nicaragua in a club frequented by a group of Sandinistas. Kermit and Fozzie's duet "Movin' Right Along" from The Muppet Movie has Fozzie get lost and drive from Rhode Island to Canada to another planet in a matter of almost thirty seconds. Hey L.A., where've you gone? Both: We're movin' right along! Kermit: You take it! You know best! Fozzie: Hey, I've never seen the Sun come up in the west? 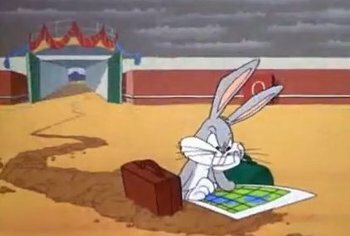 The missed turn at Albuquerque is once again the cause of all the trouble in Bugs Bunny: Lost in Time. Only this time it was a right turn. Multiple instances of this trope are said to be the cause of Nagi's ending up in Pensee, in Recettear: An Item Shop's Tale. Invoked by name (probably in reference to Bugs Bunny) in Bermuda Syndrome. In Tales of Monkey Island Chapter 3: Lair of the Leviathan, when Guybrush and Morgan are asked, "What say you, digested SCUMM?" while in the belly of the manatee, Guybrush can choose one of the topics that says, "I'm sorry, we must have taken a wrong turn at Alcatraz." The Plumber from Ratchet & Clank Future: A Crack In Time somehow ended up inside Clank's subconscious by taking a wrong turn "somewhere". It's The Plumber, so it's not hard to believe. Sam in Poker Night 2 says this during a fold. Repeated almost literally by the shadowy guy from Bob and George here . In Rusty and Co., a Xorn (a burrowing monster from the Elemental Plane of Earth) made a wrong turn at Abeir-Toril . The Whiteboard: This strip is a Shout-Out to the trope namer, when Swampy steps out onto a rather tall snowdrift and falls through it completely. A strip from Dinosaur Comics repeats the trope name almost word-for-word. The Trope Namer: Bugs Bunny frequently missed "da left toin at Alba-coiky" while traveling via wormsign, an event that has landed him in, variously, a Mexican bullfight, the Roman Coliseum, Antarctica, Australia, the American Civil War, the Wild West, medieval Europe, Scotland, the Southern United States in the middle of a clan feud, the Black Forest during WWII which interestingly enough was the first time it was said, Ali Baba's treasure cave, the Himalayas, and even an opera or two. Can be seen on a YouTube video. Herr Meets Hare: The first cartoon in which he said this, after accidentally digging to the Black Forest in Germany. Hare-abian Nights, a sort of Clip Show short directed by Ken Harris, has Bugs declaring that he should have taken "dat left toin at Dess Moins." Napoleon Bunny-Part — Bugs pops up in Napoleon's headquarters, and credits it to a "wrong turn off the Hollywood freeway." Ali Baba Bunny has Bugs and Daffy Duck tunneling towards a vacation at Pismo Beach, only to wind up in Ali Baba's treasure cave. In DC's Looney Tunes comic book, one issue's storyline centered on the apparent disappearance of Bugs, with Daffy as the investigating detective. The last page of the book shows Bugs relaxing on a distant beach, surrounded by attractive female rabbits. In the last frame of the story, he informs the reader, "I finally made that left turn at Albuquerque." In the made-for-TV cartoon "Bugs Bunny in King Arthur's Court", Bugs is en route to the Georgia Peanut Festival, only to find himself in Camelot (which he initially thinks is Pittsburgh). Following the obligatory left-turn-at-Albuquerque line, and a brief encounter with a dragon, Bugs declares, "Never again, never never again do I take travel hints from Ray Bradbury! Him and his shortcuts." In a Cartoon Network short You have questions, that's..understandable, one of the old headscratchers the short ponders is "what if Bugs Bunny took the RIGHT turn at Alburquerue". It shows an impatient Elmer Fudd and Wile E. Coyote standing at a rabbit hole, and nothing happens. Tiny Toon Adventures: Buster Bunny's version of it is "the left turn at Kennebunkport." The Warners' attempt to dig their way to Six Flags over Flushing put them in Hades. In "Draculee, Draculaa", a wrong turn at Albuquerque lands the Animaniacs in Transylvania (instead of Pennsylvania, as they intended). When they leave Transylvania and make another attempt to reach Pennsylvania, they instead arrive at Tasmania. Ben 10 — In the Omniverse episode "A Fistful of Brains", Ditto uses the same line after getting lost while burrowing underground. Ditto shares the same voice actor as Animaniacs' Yacko Warner. Yogi's Ark Lark has "the Pismo Beach turnoff." The Christmas Episode of The Super Mario Bros Super Show! has Mario's group wind up at the North Pole when they were trying to go to Hawaiiland. When asked by Mario about it, Toad says "I guess I made a wrong turn at that last iceberg!" The Mr. Men Show — When Mr. Lazy and Mr. Scatterbrain end up at the South Pole in the episode Boats, Mr. Scatterbrain says he must have taken a wrong turn at Tahiti. In the The Garfield Show episode "Boris the Iceman", Paddy the Leprechaun pops up from behind the fireplace, when Garfield has woken up from a nap while Jon and Odie are out in the snow. Paddy mutters about "must have taken a wrong turn at Alburquerque" on his way to Hawaii. Dastardly and Muttley in Their Flying Machines: "Ceiling Zero Zero" concludes with a Klunk-created tornado whisking the Vulture Squadron (in Dastardly's report to the General) "about 10,000 miles east of Albuquerque... that is, as the pigeon flies." Hulk and the Agents of S.M.A.S.H. : Trying to get rid of the team's pet dinosaur, Red Hulk tries to take it to some forest but a wrong turn (and yes, Red Hulk mentions Albuquerque) leads them to Latveria. In the Alabasta Arc of One Piece, the crew goes where they think Crocodile will be and waste 30-50 episodes on that road, of which many are fillers (much to our own drama). Seems much would have been avoided if a certain camel would have thought of explaining where certain guns go at the beginning of the filler arc. Cast Away. Chuck wound up so far off the beaten path it took him five years to get home, and the search and rescue team was looking for him hundreds of miles away. Happens in Stargate SG-1 at least once. With the Stargate itself. The Doctor Who episode "Turn Left" examines an Alternate Universe where Donna Noble never met the Doctor, because she took a right turn instead of a left. A frequent setup for the survival situations featured in Survivorman and Man vs. Wild. Wrong Turn features this trope as the central plot point for the entire film. The Hills Have Eyes (1977) and its remake. Two Thousand Maniacs! and its remake, 2001 Maniacs!, have the villains invoke this by putting up fake detour signs leading to their town. Stephen King's short story You Know They Got a Hell of a Band begins with the protagonists making a wrong turn and ending up in the little town of Rock and Roll Heaven, where things aren't as bucolic as they appear. The Twilight Zone: "The Beacon"
The Lemon Demon song "Bad Idea" is about a guy taking a wrong turn and running into a Zombie Apocalypse. Happens around Albuquerque more than anyone would care to admit. Turn-by-turn GPS-based navigation systems are designed for car drivers, and do not include information on bridge clearances or mountain passes. Truckers using them may have to backtrack dozens of miles around a low bridge or narrow pass that the GPS didn't know about, if they're lucky. If they're unlucky, they get stuck and do thousands of dollars' damage to the truck. Newer models now have "car" and "truck" settings to specifically try and prevent this. Failing to make sure that the destination you think you input is the one the GPS accepted is another source of chaos — the story is told of a truck driver who meant to go to Spain and ended up nearly driving into the North Sea because of a name mixup. Devices which contain dated map data can also lead the user the wrong way completely. In 2012, Apple launched its own version of Maps, but received a storm of criticism as their maps turned out to be horribly inaccurate. The Australian police even issued an official warning not to use it to get to the town of Mildura, because the application would leave the user stranded in the Murray-Sunset National Park, 70 kilometers off target and a very dangerous area to be in without proper preparation. In 1992, Jim and Jennifer Stolpa, along with their baby son Clayton, took the wrong turn in Nevada and ended up stranded in the middle of a barren ice desert. The mother stayed with her baby in a cave, keeping him alive by melting snow in her mouth and letting the baby drink it, while the father walked for 50 miles in the freezing cold looking for a road. This was also the subject of the 1994 Neil Patrick Harris film Snowbound. In January 2013, Sabine Moreau had intended to drive to a train station in Brussels, Belgium that was 38 miles away from her home to pick up a friend. Led along by her (supposedly defective) TomTom GPS, she eventually ended up 900 miles away from her original destination in Zagreb, Croatia, equating to a two-day trip that involves traveling through five different countries (Belgium, Germany, Austria, Slovenia, and Croatia). When asked whether or not she thought the journey's length or the change in language of the traffic signs was strange, she replied "Maybe, but I was just preoccupied.". Easy enough to do at a fair number of highway interchanges in the US, Especially from an Interstate to a US Highway or one Interstate to another. There will be two different exits, one for each direction the cross-road runs in, usually labelled as <number>A and <same number>B. Within Cities, it can be even worse, with exits for two or more different streets all exiting in quick succession. I-95/I-495 in the Washington, D.C., area are the same road for most of the eastern half the 495's loop. The good news is both sides will eventually connect to the other side of 95. The bad news is your GPS will only take you on the 95 half if your journey is going further north and will try to course correct for several miles if you decide to take the exclusive 495 portion of the loop. Also frustrating in that the 95/495 stretch crosses through three different federal jurisdictions in the span of less than a mile. If you're heading south, you'll get a series of "Welcome to the District of Columbia, Welcome to Virginia, followed by instructions which are not far off. Some GPS systems count crossing state borders as a direction and will wait until they are crossed before issuing the next step... which can add a reminder to stay on 495 in DC and then prepare for a left ramp to continue on 95. And the Virginia potion of all these roads are maddening complex and seems to be the nations laboratory for highway traffic control solutions. On June 28, 1914, the driver escorting Archduke Franz Ferdinand made a wrong turn down a sideroad, forgetting they had been detoured. While turning the car around, Gavrilo Princip walked up and fatally shot Ferdinand and his wife Sophie.